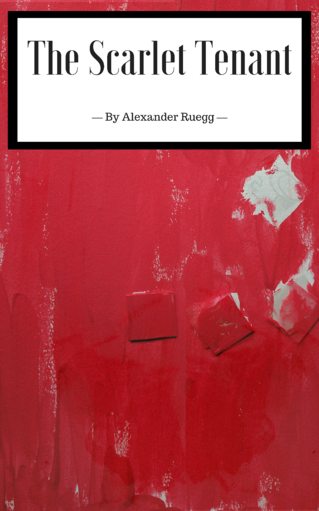 The Scarlet Tenant is a classical literature murder-mystery. It was based upon an unpublished one page short story, "The Bone Trunk," written on August 17, 2014. The story involved two men driving to a remote Scottish town with a payload of unknown bones rattling in their car's trunk. Upon completion of "The Bone Trunk," nine more chapters were outlined under the potential title, "The Wail." Four chapters were drafted by the end of 2014 before the storyline was abandoned. On June 7, 2015, a revised first chapter was written. Additional versions of this chapter were drafted in August and October of 2015 under the temporary title, "Good Content." In May, 2016, a new version of The Scarlet Tenant was developed, its first chapter titled, "A Wealth of Vacancies." This draft evolved into something closer to the finished version. On June 22, 2017, a completed draft of the novel was finished. It was released as a free book to read online, as well as for digital download on Kindle and e-reader devices. The Scarlet Tenant takes place in the fictional Scottish town of Neirmereich. It is the only book on Ghost Little to take place in the modern era. Chronologically, it is the middle part of the loose trilogy formed by The King North of the Sky and The Diffused States of America. It shares minor connections with both. Nevertheless, The Scarlet Tenant is a standalone story. Despite taking place in the modern era, its rural setting establishes an isolated, cut off feeling for the characters. Niermereich teems with old ghosts and disturbing oddities. The town's foundation is situated on an odd mineral sediment. Its bay crawls with strange sea creatures. A small island called a skerry, a plugged font for a long-dormant volcanic vent, lies offshore, and upon it, the deranged Remington family has built its estate, long abandoned. The Remingtons are a locally-despised clan of English nobility that have vacationed in the Niermereich for generations. They earned notoriety when Arthur Remington I wrote "The Scarlet Tenant," a semi-autobiographical novel, that earned a cultish following the world over after it was distributed to Allied sailors during World War II. The novel encouraged two myths: first, how much of it was true? Second, why did the Remington family build an entire publishing house to protect its copyright, only to bar it from ever being re-printed? Strange, moon-burned carcasses have begun washing up on Niermereich's beaches, and Theresa Leone, a native daughter of the town, has returned home with a dark intentions toward the Remington family. Theresa Leone is the main protagonist, an editor and writer at Fairfax Publishing House. She is good humored, ambitious person with an eye for manipulating talented individuals. She spent a good part of her career ghost-writing celebrity autobiographies for Fairfax and optioning publishing house's creative properties to Hollywood for movie adaptations. Her most recent assignment has brought her home to Scotland. There, in the northern lands, she investigates the Remington mansion, where she is researching the family's patriarch, Arthur while care-taking at the gigantic estate. Niall Wales is Theresa's aging uncle. Naill has recently failed at retiring and is desperate for Theresa's help in publishing his book. Niall lives in Niermereich year-round and arrived unannounced to confront Theresa at the Remington mansion. Victor Han is an old classmate of Theresa's. She and Victor learned together in Edinburgh from Professor Astrid Cornwallis and remained close. Victor works for Fairfax Publishing's parent company, and only occasionally finds a moment to visit when he is not traveling for business to Asia and South America. Arthur Remington III, mentioned only in name, is the owner of the mansion where the first chapter takes place. He is the sole protector of the copyright to "The Scarlet Tenant." Mercury is Arthur's old dog. Named Mitchell in earlier drafts of the story, Mercury has been a member of the Remington clan for generations and appears to be ageless. He also appears to be far more than a dog. Lashed together by odd organs and seashells collected from the bottom of an ocean bay, Mercury comes and goes as he pleases, kept alive by something that cannot be explained. He is a mythic guardian. His purpose, intentions, intelligence are unknown. Genevieve is contractor hired by the Remington Group to assess the geological and sociological significance of a dig site above Niermereich. An experienced mountaineer,Genevieve has studied dead cultures around the globe in every manner of dangerous climate. Growing disenfranchised with the rigid lack of curiosity in her contract employers, Genevieve searches for the unexplained phenomena and implements potential solutions with experimental methods. The Scarlet Tenant was born from a desire to tell a story in a harsh, English environment in the style of classic Byronic literature, such as Wuthering Heights, Jane Eyre, or A Portrait of the Artist as a Young Man. It was initially drafted as a story about two men driving through the Scottish highlands to a seaside town with a bunch of bones rattling in the trunk of their car. That's a neat image. Where are they driving, exactly? We'll find out. What sort of bones are they? We'll find that out, too! When I determined it was more than just a short story, I restructured it several times with the intent to present it with other free books to read online. From there, the story changed. One of the men in that car became Victor, who appears in the current draft. The other man became Nicholas, who is Theresa's boyfriend, a character who has not appeared at this point. There were a number of short chapters in this initial draft concerning Victor and Nicholas delivering the bones to a small, well-financed dig site. The dig site was run by Victor's girlfriend, Genevieve. At that point, Victor returned to the city and Nicholas reconnected with Theresa back in town. In the eventual draft, Victor and Genevieve's relationship was removed entirely. It was obvious that Theresa's motivation in returning to her strange hometown was the most interesting part of the story. I'm sorry if two guys talking about some bones sounds interesting. I promise, it wasn't. I liked Victor from my time writing him in Diffused States. Nicholas, on the other hand, while he was written to be obnoxious, was not a fun character to hang out with, and he weakened Theresa's character by proximity. Nicholas existed in certain drafts as a foil to Theresa but was removed entirely from the main storyline in the eventual draft. Nicholas only appears in flashbacks. Thus is the flexibility of free books to read online: you can make major edits to this sort of living document. With that, the story was re-drafted to focus on Theresa and what brought her to the town. The characters' intent to investigate the local Remington mansion was already planned, so I trimmed back Nicholas and Victor for the time, and leaped straight to that with Theresa. Her characterization at that time was a literal sexual attraction toward the secrets of powerful people, for whom she ghost-wrote autobiographies. That desire was framed as a callback to the repressed sexuality found in the older English literature I was emulating. She found herself in over her head trying to get a story on Arthur Remington III, a local hero from her hometown that safeguards the copyright on the cult literature mainstay, The Scarlet Tenant. That part of the story stuck. The Scarlet Tenant's poisonous history interested me. However, Theresa's sexuality dominated her personality. Going forward, I didn't bury the trait, but its role was reduced. The story was shelved for a number of months while I worked on a re-write for Diffused States. When I returned to Theresa, I realized that I like writing my characters in the other stories because they were always struggling through a tough day. They were usually in danger. So what if Theresa was the dangerous one? What if in this harsh environment of deception, and ghosts, and hereditary wickedness, Theresa was the most deadly thing in the room? It upped the stakes for what she was getting herself into. The story was refined even further. Theresa was still after The Scarlet Tenant, it begins in the mansion itself, this time, and it reintroduced her younger cousin, Niall, who originated in the first draft. The story became even more about creativity in a modern landscape where everything is a rebooted intellectual property, a topic that is very important to me as an independent writer. The value of content is always on my mind, hence positioning the complete draft for The Scarlet Tenant with the other free books to read online. 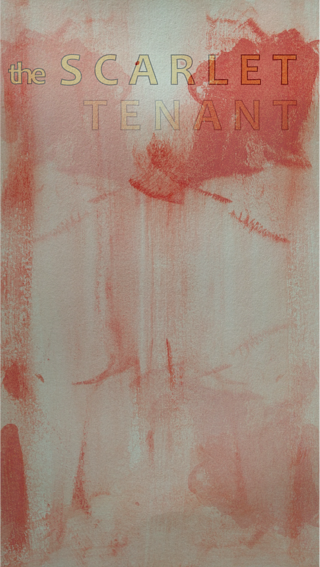 The Scarlet Tenant has ebbed and flowed during its development. It is a supreme challenge. The drafts have proven that you can always revise and refine. As long as you don't mind throwing out entire ideas and reams of pages, you'll find what's remarkable in that initial kernel. August, 2017: The Scarlet Tenant is on editing hiatus while work is continued on The King North of the Sky. The next draft of The Scarlet Tenant is scheduled for production in October, 2017. May, 2016: Story beats for The Scarlet Tenant have endured from the initial draft. Characters including Nicholas and Genevieve are set to join Theresa and Niall in the current version as they dig deeper into Niermereich's weird history and the wicked legacy behind "The Scarlet Tenant."